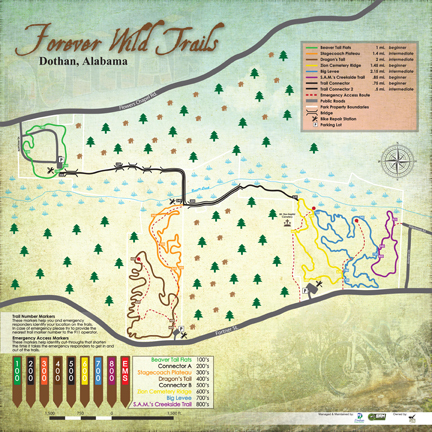 Dothan’s “Forever Wild Trails at Beaver Creek” is part of Alabama’s Forever Wild Land Trust with 400 natural acres located inside the city limits between Flowers Chapel Road and Fortner St. This unique recreational resource provides a rich experience for trail lovers, mountain bikers and hikers alike. All users appreciate the 10 plus miles of naturally wooded trails with opportunities to hike or ride 1-2 mile loops or tackle the whole trail system. Everyone enjoys the mile-long section of bridges through the beautiful wetlands and the scenic views of Beaver Creek. Concerning challenge – there are opportunities for all levels from beginners to advanced riding and hiking. Mountain bikers enjoy the constantly changing terrain promoting a steady rolling single track experience. Advanced riders can experience plenty of “airtime” along the way and deploy their skills on the Wall Ride Loop and the Big Levee feature. Hikers love to “tune up” on the Forever Wild Trails in training for time on the Appalachian Trail. Forever Wild Trails also boasts convenient access with three well equipped (personal maps provided) trail heads to choose from in order to be closest to your favorite trail sections. Come experience the natural high of time spent close to nature and find out first hand why SORBA (Southern Off Road Bicycle Association) selected Forever Wild Trails at Beaver Creek for their Summit in 2017. Trails open daily from 6:30am to dusk. Trails were designed by IMBA (International Mountain Biking Association) and professionally built by Flow Motion Trail Builders. The day to day management of this state resource is trusted to Dothan’s Leisure Services Department, in conjunction with the Southeast Alabama Mountain Bikers who partner with trail care and program planning.